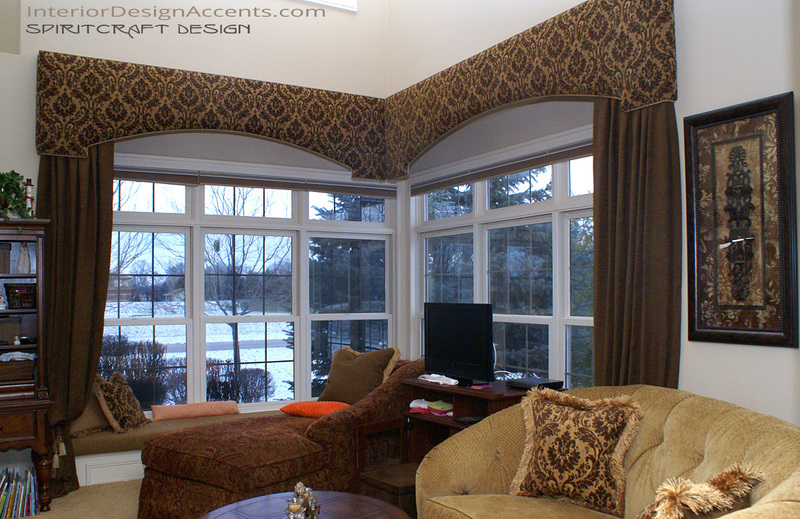 A new installation of cornice and drapery panel custom window treatments by Spiritcraft Design in Crystal Lake, Illinois. Hard cornice window treatments along with drapery panels offer many design options that work in any interior home decor style. 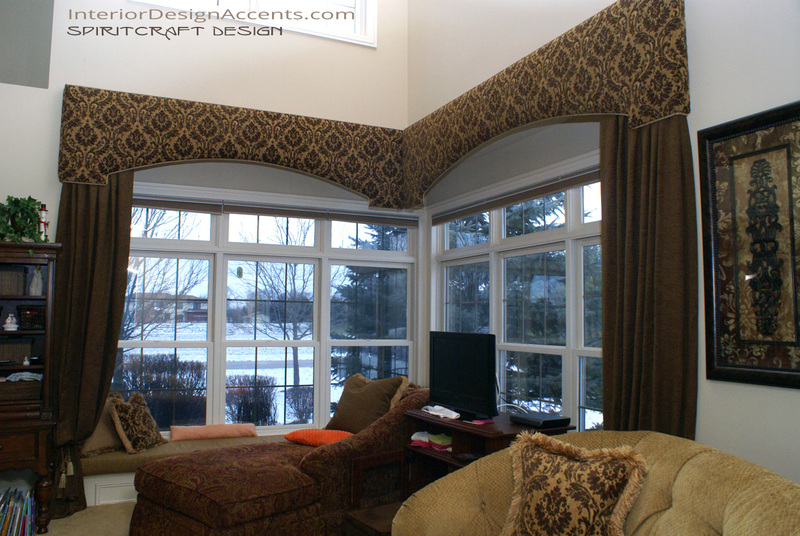 This installation combined shaped and arched hard cornice treatments with full, thick drapery panels that puddle and are gathered with complimentary decorative tassel tiebacks. Custom matching decorative pillows add to the visual appeal, create warmth and are focal points in the room. 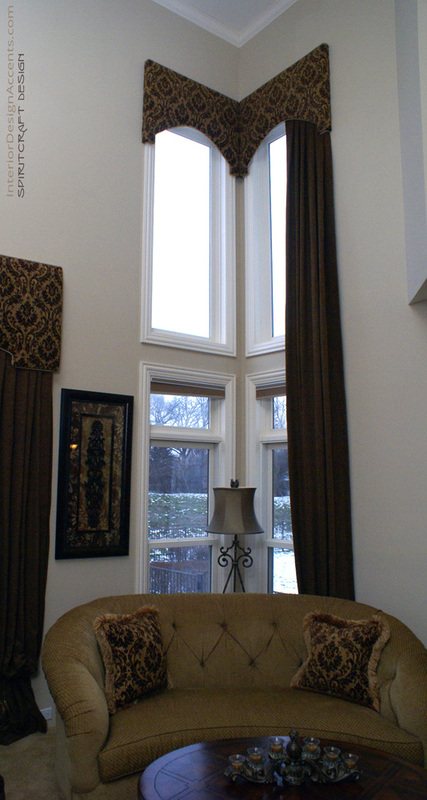 In the case of this room, our client wanted window treatments framing the joining large windows but was not quite sure how to accomplish her goal. The challenge was to find a window treatment design that worked with the soffit and the upholstered window seating below. 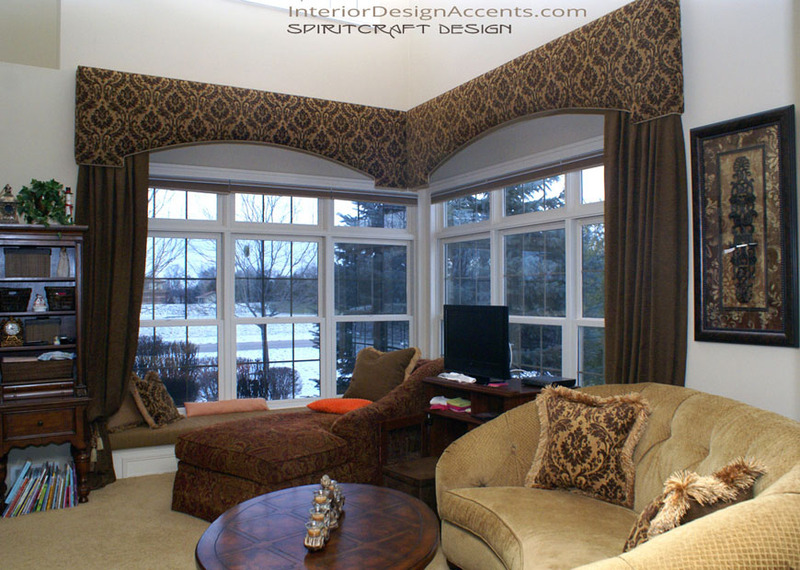 We ended up with a window treatment design that perfectly framed the large windows and also achieved a cozy feeling when using the window seat. Click on images to open larger versions. 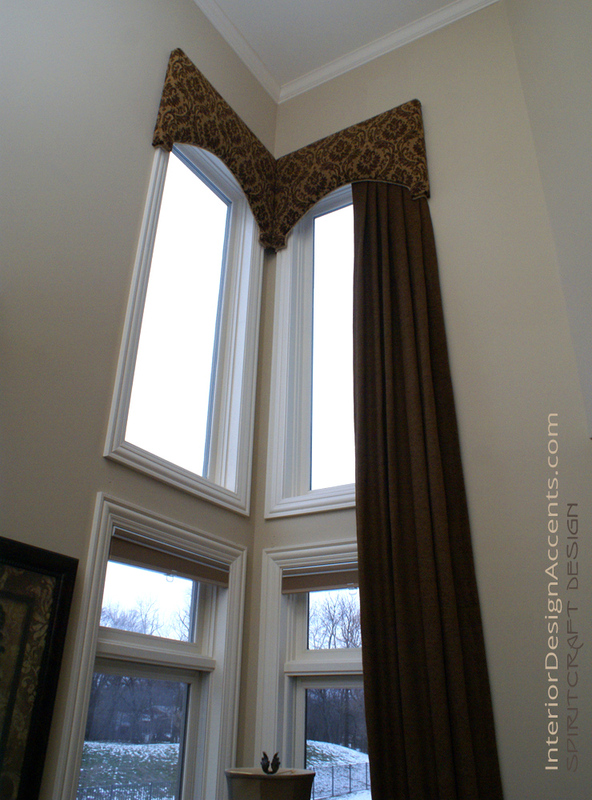 We also designed and installed matching hard cornices for the high corner windows and also had to join these in a miter to allow them to meet seamlessly at the corner. The long, two story drapery panels also puddle and are tied back with decorative tassels. Again, the decorative panels were added for further visual appeal and add a comfy and inviting feel to the room. 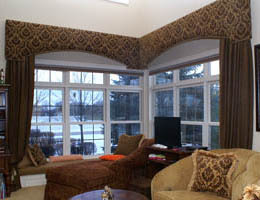 Hard cornice treatments are distinctive and very adaptable custom window treatments and will enhance any decor style. As is the case with this room, the raised arch hides the geometric soffit and compliments the large window configuration thereby softening the rooms decor. 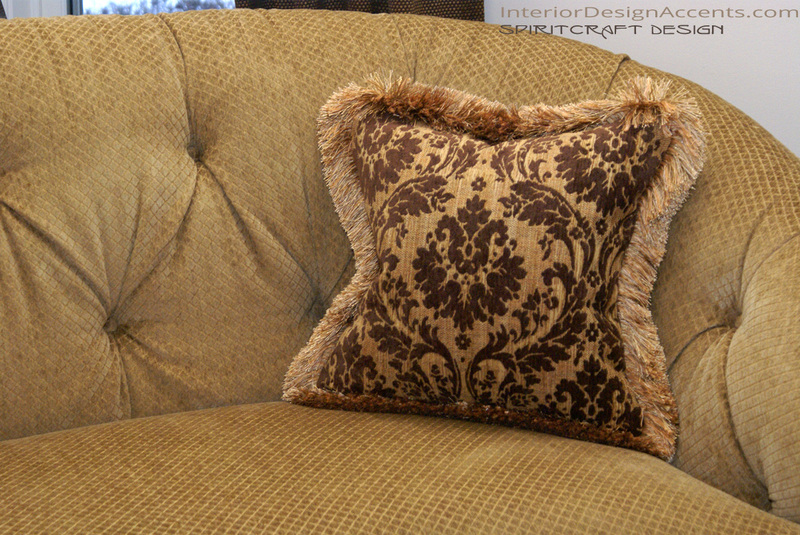 In a more contemporary decor style, a rectangular design would be called for with perhaps a geometric fabric. 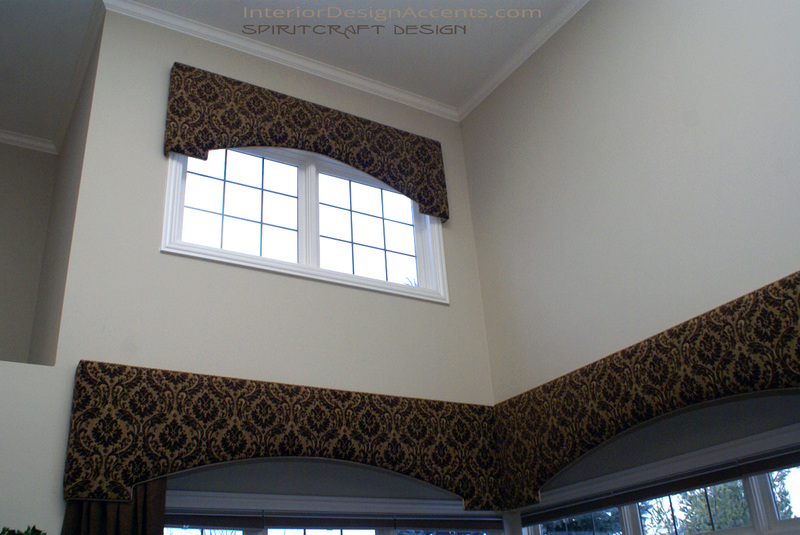 Drapery panels are often employed to add to the cornice treatments, frame the window more fully and to add the ambiance that only custom drapery panels can provide. In this room, the drapery panels are decorative or stationary but we often employ operational curtain and drapery panels with hard cornice treatments. 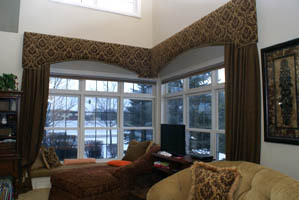 The designer fabrics and trims pictured at this Prairie Grove, Illinois installation are by Barrow Fabric and Kravet Design. For more information or to inquire about a free consultation, please feel free to call 815-893-6609 in the Crystal Lake area of Illinois or 847-852-7979 in the Barrington – Palatine, IL area or 262-374-5960 in East Dundee, IL. You can also email us if you prefer.